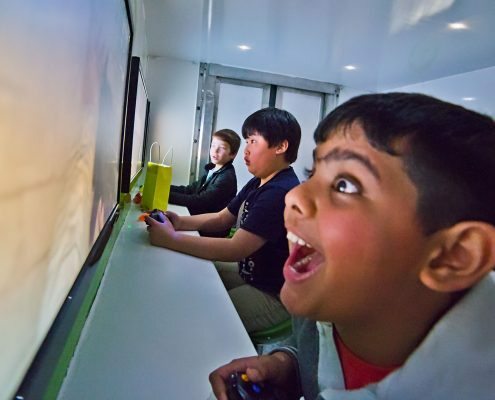 The iBox is a mobile video game party truck and will entertain large groups of children, which makes it perfect for Eid celebrations, it really is the best party idea you will find because children love to play on the Xbox. The iBox enables 9 people to play together at the same time, typically we run this as a competition and have gifts available from our shop for the winner and all invited, we also have our own invitations. Our Eid entertainment can be held wherever your Eid celebration is taking place, either outside your home or at a local venue, we only require access to one power socket. We can time our entertainment to start just after your celebratory meal. How many children (and adults) can the iBox entertain at your Eid party? 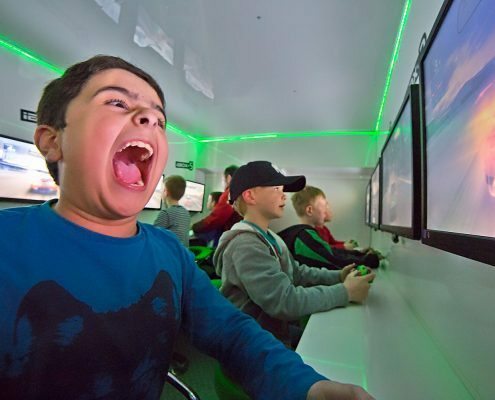 Each iBox vehicle can entertain up to 12 children. It has 9 seats and screens, for numbers over 9 we can rotate everyone so that all children get an equal go. For larger numbers we also have a 2nd vehicle available (this would require additional booking notice to secure). Hiring two iBox’s enables 18 players to play against each other at the same time. For our price list please visit our Rates & bookings page. For further information about our Eid entertainment, please speak to Ben on 07966 360 880. We can also entertain other family functions such as Wedding Entertainment and we also have a shop where you can add merchandise to your booking.